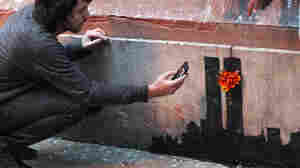 October 20, 2013  The reclusive British street artist has unleashed a participatory experiment on New York. We take a visual tour. 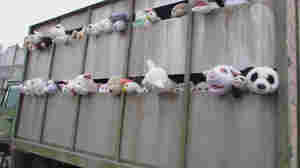 October 16, 2013  The street artist's latest piece is called "Sirens of the Lambs," and it features a bunch of cuddly puppet animals peeking out of a slaughterhouse truck, squealing with fear. The truck is set to tour around New York City for the next week and a half. 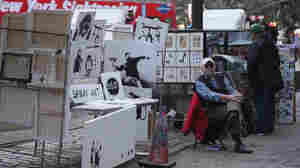 October 14, 2013  New Yorkers who love a good bargain missed a golden opportunity Saturday, when the artist and provocateur Banksy, whose sly graffiti art adorns collectors' walls, opened a sidewalk kiosk to sell his work for $60 a canvas. July 26, 2013  The mural — "No Ball Games" — was cut out of a wall in London, just like another one earlier this year. This time, the auction house selling the piece will donate proceeds to charity. May 12, 2013  The stencil of a young boy sewing the Union Jack is the centerpiece of an exhibition in London, after which it will head to the U.S. where it is to be part of a private collection. Organizers say Slave Labour is not being put up for sale, but residents of the London neighborhood from which it disappeared want it back. February 24, 2013  The U.S.-based auction house that was due to sell the work on Saturday, announced that the item was withdrawn from sale. The artwork was expected to fetch between $500,000 and $700,000. February 22, 2013  The controversy began when a piece of graffiti on a London wall appeared at a Miami auction house. The piece of art is scheduled to fetch up to $700,000. The community in London said its sale would be immoral. Now, after a tug of war, a stenciled rat has appeared nearby.